Have Your Cupcake and Eat It Too! - Luna and Ori Birthday Card! 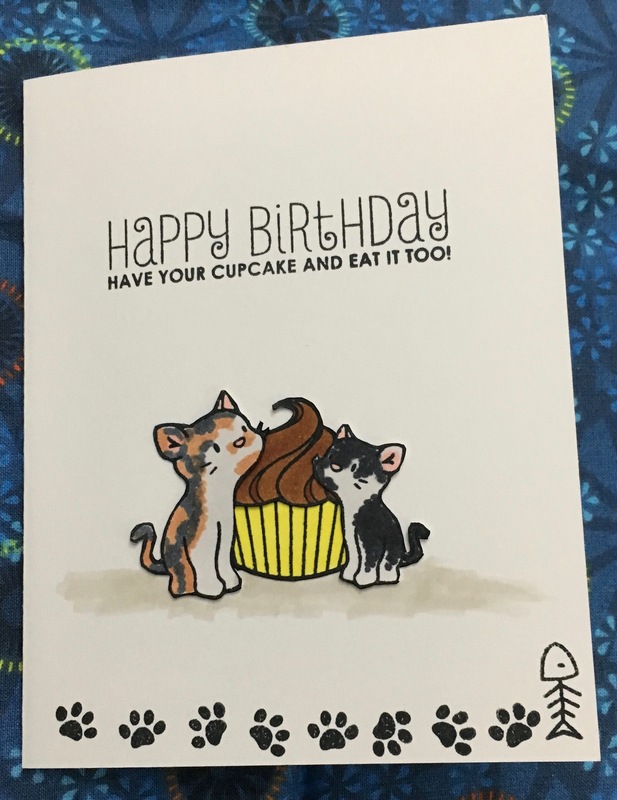 This birthday card was made for my son and I wanted the two cats on the front to look like his cats. They are siblings and the little boy, Ori, is smaller than his sister, Luna. And they are also different colors, so I wanted to make sure they were as close to what they looked like as possible. This was the first year weren’t able to celebrate his birthday with him. He was always home from college during winter break so we could celebrate so now that’s he’s graduated and lives eight hours away from us, we are celebrating his birthday when we see him during the holidays. I had to include a cupcake on the birthday card because it’s not very often he’ll indulge in sweets. He’s been a distance runner since his freshman year in hight school and was fortunate enough to keep on running in college and is continuing to run since graduating. I knew he wouldn’t have a cake on his birthday, so the cupcake on his card was my way of letting him know we were thinking about him. I used Purrfect Pair from Mama Elephant stamp and die set for the cats, I used Carnival Cupcakes from Mama Elephant stamp and die set for the cupcake and I used Carnival Topper from Mama Elephant for the greeting on the front of the card. For the greeting on the inside of the card and for the “handmade by” on the back of the card, I used Cat Sayings by Stampendous stamp set. 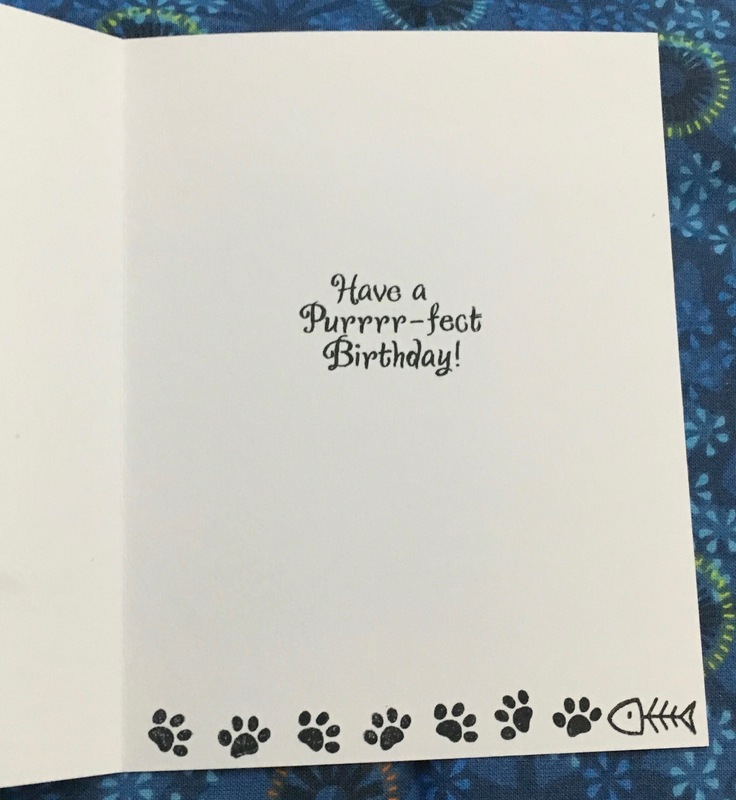 I used the paw print and fish from Purrfect Pair and Cat Sayings to create a border on the front of the card and on the inside of the card. 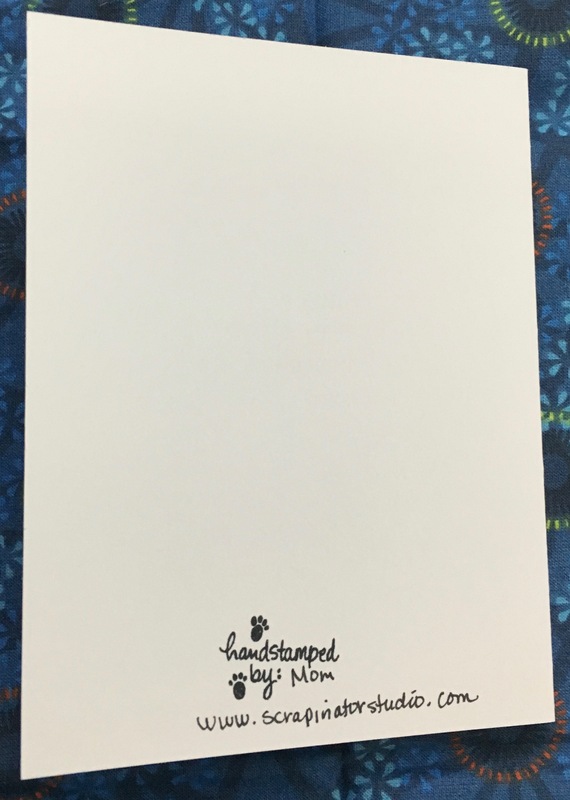 What’s great about the small stamps included with most stamp sets, is you can create a border or accents with them or so many other things for your cards. I stamped everything in Memento Tuxedo Black Ink so I could use Copics for coloring. I colored the cats based on pictures I have of them. That’s the best advice I have for someone trying to color a pet, have a picture nearby for reference. After everything was colored, I cut them out with the coordinating dies using my Sizzie die cut machine. I mounted the cupcake pieces to the white side fold notecard base with a strong adhesive then placed the two cats on top of the cupcake pieces. I colored in with a Copic marker some shadow under the cupcake and cats after they were placed on the notecard. And for anyone interested in a picture of the adorable cats, I've added one below. 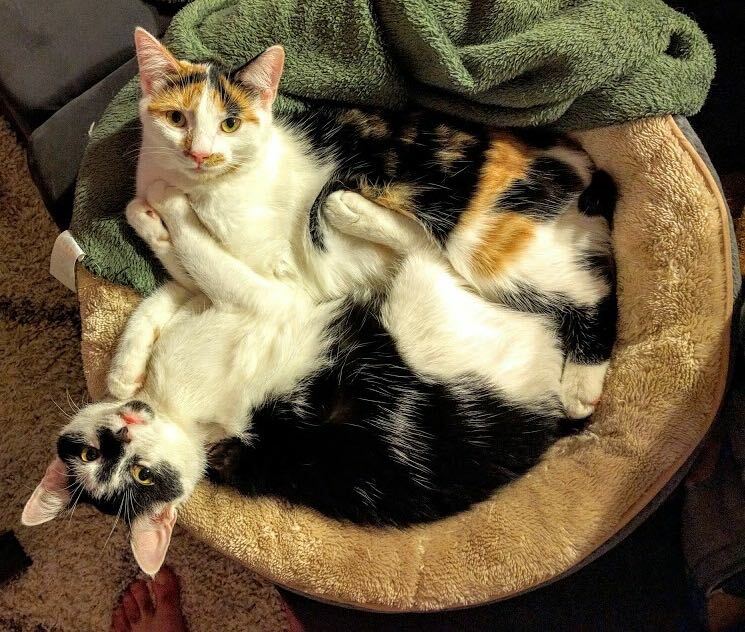 Luna is the one on top, she's the calico and Ori is on the bottom and he's the tuxedo or the black and white cat. It's hard to see in the picture that Luna is bigger than Ori. Then I stamped my greetings and the borders. Thanks for stopping by and stay tuned for a new blog post soon! !